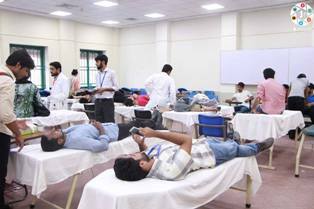 To celebrate the true spirit of Muharram in the Hussaini way, the Forman Journalism Society organised a blood drive for the patients in collaboration with Shaukat Khanum Memorial Cancer Hospital & Research Centre (SKMCH&RC) and LUMS Community Service Society. The Mercy Health Center also aided the society to make this event happen. FCCU students were enthusiastic to participate in the drive. The event was supervised by the Advisor FJS and Assistant Professor of Mass Communication, Syed M Saqib and lead by President FJS, Ahmed Shujah. 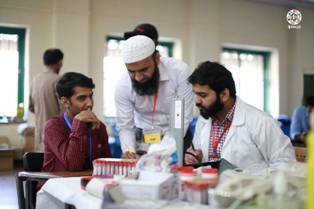 The desk set by the team of Shaukat Khanum noted the Blood Pressure and assessed the health of patients considering their past health history. The ones who had suffered from any virus or disease like TB were, or if their HB levels were low than 12.5 were rejected. Then the screen sampling was done. The medics officers including Nazakat Shafiq, the medical technologist SKMCH and Dr Ahmed, Medical oncologist informed that one donation can save up to three lives with the provision of platelets and plasma. Mr Nazakat told that usually only 78 people show up, but in FCCU more than 130 people have come for blood donation which remains a great experience for us. To encourage the spirit of blood donors, more than 10 tests would be performed free by Shaukat Khanum for which they would be contacted soon. Usama Shahid, the president of LUMS Community Service Society encouraged the turn out that the crowd exceeded his expectation of 90 people to nearly 200, the spirit which should be encouraged. Forman Journalism Society takes great pleasure in becoming the part of such a humanitarian cause. There can be no greater act than to become a source of ecstasy for the people. The reports about the blood donors would be provided in the next two weeks.